Graphic artist Wes Wilson pioneered the rock concert poster aesthetic of the late '60s, translating the sights and sounds of San Francisco’s counterculture society into the psychedelic iconography that endures today among the era's most indelible images. Put another way, Wes Wilson single-handedly pioneered what is now known as the psychedelic poster. Born Robert Wesley Wilson on July 15, 1937, he drew throughout childhood, and attended San Francisco State University. He was working at Contact Printing, a small San Francisco press, when his career as a psychedelic poster artist took off. At Contact, a small press that produced handbills for the Mime Troupe Appeal parties produced by concert promoter and impresario Bill Graham, Wilson did the layout and design for handbills that eventually established him as a poster designer. When the Avalon Ballroom (where shows were typically produced by Chet Helms and The Family Dog) and Bill Graham's Fillmore Auditorium began to hold weekly dance concerts, Wilson was called upon to design the posters. The Trips Festival staged during late January of 1966 was among the events publicized by a Wilson flyer; he also attended the event, and the combination of music, drugs, and love impacted him deeply. By the middle of the year Wilson stopped producing materials for Helms altogether, preferring instead the creative freedom offered by working for Graham; his posters became wildly experimental, inspired largely by his discovery of the Viennese Secessionist lettering style developed by Alfred Roller. Wilson altered the style to fit his own ambitions, rendering the characters with almost indistinguishable singularity by expanding their outlines and inset shapes; at the same time, he played with foregrounds and backgrounds, his design patterns becoming increasingly exaggerated with each new creation. Wilson's other major breakthrough was in his use of color -- inspired by the light shows of the concerts themselves, he mixed colors with wild abandon, resulting in jolting visuals that perfectly captured the revolutionary essence of the music his art promoted. 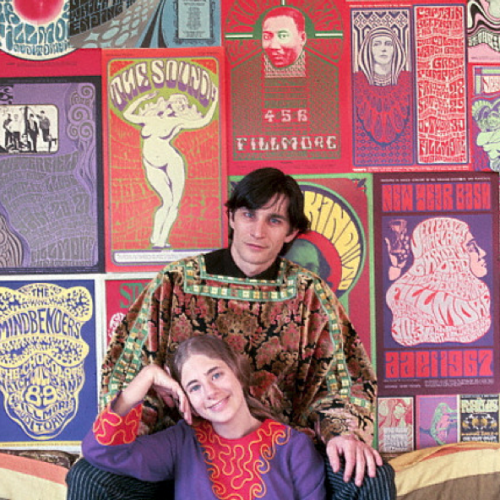 Wilson's work quickly moved beyond the confines of the psychedelic subculture into the mainstream, resulting in profiles in magazines including Time, Life, and Variety; however, in May 1967 he stopped producing posters for Graham, claiming the promoter had failed to honor their existing royalty agreement. Wilson's early work was unique, but by mid-1967, so many artists had copied his style that he was easily replaced. He is generally regarded as the pioneer of the psychedelic poster and inventor of the psychedelic font which made the letters look as if they were melting or floating. The style of the font was derived from a Viennese Secessionist style of lettering he discovered in a University of California exhibition catalogue. His early posters were also distinguished by their stylistic borrowings from artists such as Mucha, Beardsley, and Klimt. Art Nouveau-inspired figures and lettering, stylized almost to the point of illegibility, flowed together in a single, integrated design. His creations were more than just announcements of who was playing on a given evening, but bold visual chromatic statements. The playful use of colors, according to Wilson, was dictated by his own visual experiences with psychedelic drugs, mostly LSD. In summary, it is safe to say that the psychedelic poster, as we have come to know it, was defined by Wes Wilson sometime in the summer of 1966.